Feel free to read something Christmassy – or not. Either way, there’ll be paper chains, mince pies, and the cheesiest Christmas playlist I can find. And if you wear a Christmas jumper, it’ll make my night. Hosted by yours truly, expect spoken word, short readings, poetry and more at this open mic night for writers and wordy buffs. 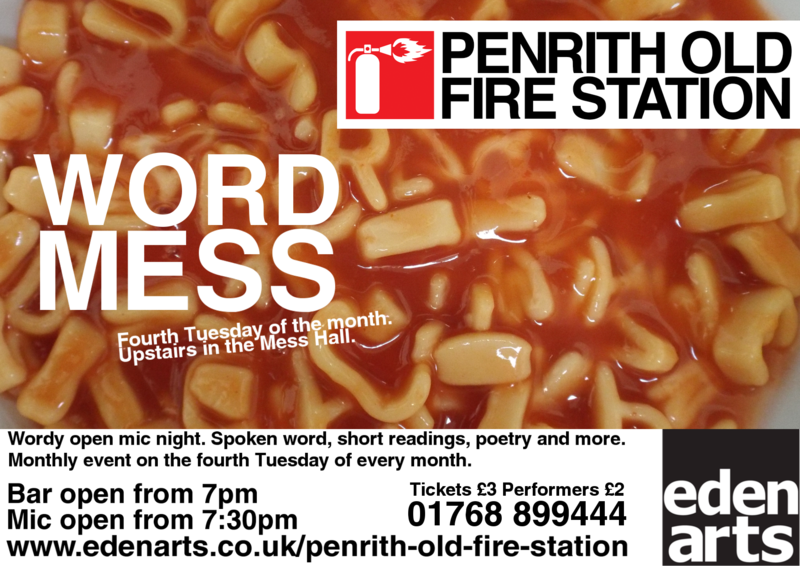 Come along to our cosy Mess Hall (upstairs in Penrith Old Fire Station) and listen to some great new writing – or, if you’re in a sharing mood, bring your stories / poems / bits of script / travel writing / love letters / Christmas round robins / angsty teenage diaries. *This is just a turn of phrase. We don’t actually have a curtain. We do have a bar, though. And a lamp. NO SESSION IN AUGUST – HAPPY SUMMER HOLIDAY! Penrith Old Fire Station is between the hospital and ambulance station, so there isn’t far to go if you get overwhelmed by all that wordy goodness. Outside of office hours (Monday – Friday 9am – 5pm) you can park in any of the NHS staff car parks that surround Penrith Old Fire Station (even though they say permit holders only). Please note that there are stairs up to the Mess Hall. Feel free to use & follow the #WordMess hashtag, and to get in touch if you have any questions.